[XPB-ULWBNB4] The U-Leg Backless Wire Bench is constructed with a welded wire Seat, 3" 11-gauge steel Legs with pre-drilled mounting holes. 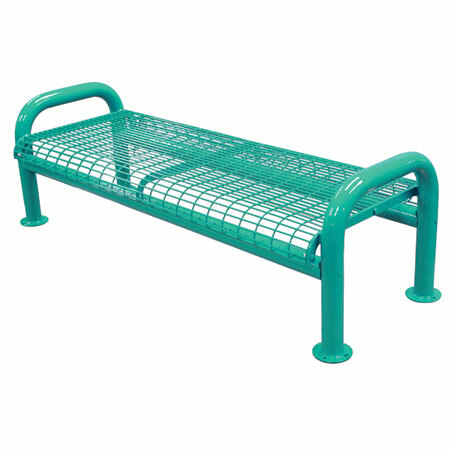 Wire metal bench is coated in Thermoplastic, a durable weather resistant finish, and available in 16 color choices (see Color Selects). U-Leg benches are great indoor or outdoor for entry ways & garden areas .Available in 4 Ft., 5 Ft., and 6 Ft. Lengths (See Bench Choices). Compliment your bench with matching Receptacle sold separately. For shipping quotes, discount pricing, orders or questions please call our Customer Service Center at 1-877-483-9270.